Originally posted: June 17, 2017 . Last modified: August 25, 2018 . 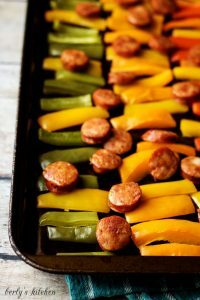 This time-saving sheet pan spicy sausage and peppers recipe is a fantastic idea for a quick, delicious, and filling weeknight meal. Less than 5 ingredients and just one pan makes this dish a great dinner option! This sausage and peppers recipe might just be the easiest recipe on our entire site. It’s hands down one of the most versatile and crowd pleasing recipes that we’ve made. What makes these sausage and peppers so great? Let me tell you! 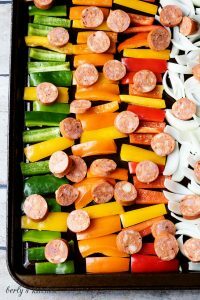 It only takes a few minutes to slice up the peppers, onions, and sausage, then toss them on a sheet pan. Pop it in the oven, and let it cook! Doesn’t get much simpler than that. 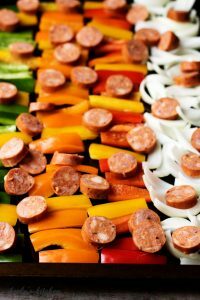 Not to mention, there are so many types of sausage and peppers, so the possibilities are endless. 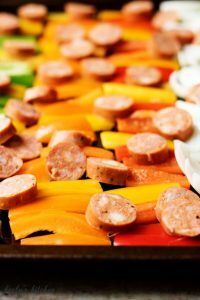 There are a lot of sheet pan recipes similar to this one on the internet. When I Googled it, over 133,000,000 results came up! That’s crazy! However, what separates our dish from all the others is that we use fiery, Cajun andouille sausage links. The distinct spices and savory cuts of pork add a unique taste that other recipes just can’t duplicate. 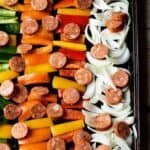 How do you cook sausage and peppers in the oven? Start by preheating the oven to 375 degrees. Next, choose what kind of peppers you’d like to use. Slice the peppers and onions into similar sized pieces. It’s important to keep the pepper and onion pieces the same size, so they’ll cook evenly. Next, cut the sausage into circular pieces. They should resemble thick coins. Spray a baking sheet with non-stick cooking spray, and arrange the peppers and onions in an even layer. Place the sausage pieces on top of the peppers and onions. We didn’t use any salt or pepper simply due to the sausage being salty and having it’s own flavoring. However, feel free to salt and pepper to taste. Place the baking dish in the oven and bake for 20 to 25 minutes or until the vegetables are tender and sausage pieces are cooked through. Remove the pan from the oven and serve immediately! 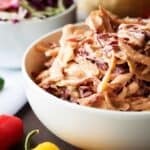 It’s that simple to make a quick and easy weeknight dinner that’s not only satisfying, but also has both vegetables and protein. We like to eat sausage and peppers all by themselves, but we completely understand that some people might want to add a side dish or another component. 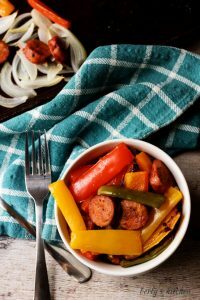 These sausage and peppers would be great over a bed of pasta noodles or on a sandwich or hoagie bun with cheese. Sausage and peppers over rice is another option. What different kinds of sausage can you use? There are so many different types of sausage out there, so it’s really up to you. We like the spiciness that andouille brings to the dish, so that’s what we chose. However, chorizo, Italian, Polish, or Kielbasa are some other varieties. Since each type of sausage has a different taste and different amount of spice, it’s very subjective. Use what you and your family will enjoy! Make sure the sausage is cooked through prior to serving. It sounds like common sense, but I wanted to mention it. Some sausage is sold precooked, so it only needs to be reheated. Other sausage needs to be cooked all the way through. This recipe should allow enough time to cook the sausage thoroughly. However, it’s best to know what kind of sausage you’ve purchased prior to getting started. Cut the ingredients to the same size to ensure they’ll cook evenly. Nothing is worse than having overcooked onions and under-cooked peppers, because they’ve been cut to different sizes. Choose flavors you and you’re family will enjoy. If you don’t like green peppers, leave them out. Maybe add poblano peppers instead. As with all of our recipes, many of the ingredients are interchangeable. We want you to enjoy the food, so make it to your liking. Use our recipe as a guide. 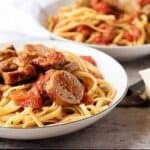 If you like this sausage and peppers recipe, please leave us a comment and rate the recipe card. You can also find us on Facebook, Pinterest, Twitter and Instagram searching for Berly’s Kitchen! 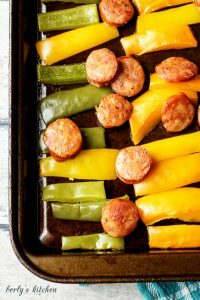 This time-saving sheet pan spicy sausage and peppers recipe is a fantastic idea for a quick, delicious, and filling weeknight meal. Next, wash all the peppers, then slice them into strips approximately 1/2 inch in width. Afterward, peel the skin from your onion and slice it in half. Then, slice the onions halves into chunks about 1/2 inch pieces. After that step, remove the sausage from its packaging and slice the ingredient into 1/2 inch circles. Last, spray a sheet pan with non-stick cooking spray and lay all the ingredients onto the pan. Place the into your preheated oven and let everything bake for 20 to 25 minutes. Once the sausage, onions, and peppers are done, remove them from the oven and serve while the dish is still hot. The calorie count listed below is an approximation based on the ingredients listed. The sheet pan meal can be served over rice, pasta, or on a hoagie bun with marinara. I LOVE this. We make something similar nearly every week and it’s absolutely a family favorite. Gotta love one-sheet/one-pan meals! 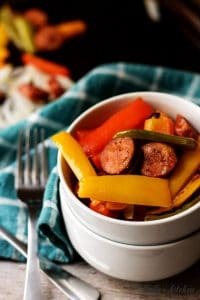 We love sausage and peppers together, and this recipe looks like one my family would really enjoy! That’s looks amazing!! I definitely want to try it out. This looks delicious! Love sheet pan meals! Pinned for later! Thanks for sharing this recipe! Such a great idea for a quick weeknight meal. I love cooking with peppers, and I especially love meals that are easy to prepare. Will definitely be giving this one a try soon! you had me at time saving! This looks so delicious and sausage is always a good idea! This looks amazing! And so easy!!! I love easy one pan meals like this! So easy and so tasty, great recipe! I love sheet pan meals! They are so simple & this recipe looks super tasty!! Thanks for sharing! This look so delicious my tummy is rumbling right now! UH, yum! This sounds like something I would be able to make! Delicious.